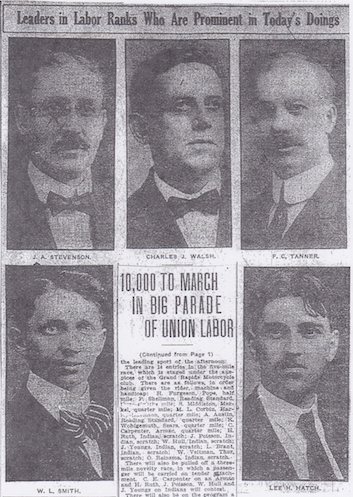 According to the September 4 issue of the Grand Rapids Herald, 10,000 people planned on marching in the 1911 Labor Day Parade. According to the Herald, fifty-two unions participated in the march, which began at 10:00am on Bridge street, making it’s way on Canal, Monroe, Division, to Wealthy and back down Bridge street. There were eight divisions participating in the parade, with a band at the front of each division. Unions from all over the state came to the Labor Day Parade in Grand Rapids, including Lansing, Benton Harbor, Ludington and Muskegon. The activities of the day also included a bicycle race, a motorcycle race, a boxing match and a baseball game. Coming off of the longest labor strike in Grand Rapids history, a strike that lasted 17 weeks and involved an estimated 7,000 workers, lots of support and solidarity permeated the air on that early September day in 1911. The furniture workers led the labor day march of course, just after voting to go back to work in August, thus ending the labor strike. The unions had run out of funds to cover the striking workers and out of desperation and the need to take care of thousands of families, the strike came to an end. However, such a massive outpouring of support just weeks after the strike came to an end, was a further demonstration of the popular support shown by the larger community. Besides the 10,000 marchers, thousands more lined the streets to cheer the workers who had fought for the dignity of a city and its working class community. Even though the workers did not win any of their demands, they demonstrated the potential of working class people to organize the workplace. Putting the 1911 Labor Day Parade march in perspective, 10,000 marchers may not seem like an impressive number on labor day, but consider the fact that there were only 112,000 people living in Grand Rapids at the time. This means that more than 10 percent of the population had participated in the Labor Day parade. Further evidence that the community was deeply supportive of unions and working class issues. Grand Rapids was indeed a union town. This entry was posted in Anti-Capitalism/Labor and tagged 1911 furniture workers strike, 1911 Labor Day Parade, Labor Day Parade in Grand Rapids. Bookmark the permalink.